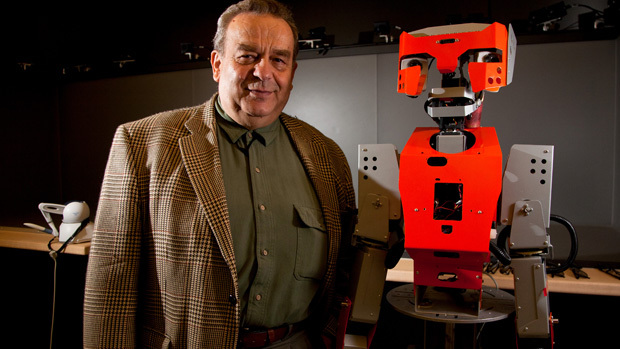 At the University of Ottawa researchers are working on a robot called “Pumpkin” that will look like us, with artificial skin and a face that can express emotions…like us. The Canadian team, who apparently have never seen a Terminator movie, seek to make this robot even creepier with a network of tubes under the “skin” that will circulate warm water; making the touch of it less cold and robotic . Hopefully, they’re keeping Asmov’s Three Laws in mind when they use Kinect to help make Pumpkin Our Destroyer‘s movements more human-like. Instead of laborious programming of specific movements, they employ a Kinect depth sensing camera to capture themselves moving then transfer the data to teach Pumpkin how to evade detection and hunt us all down. You can skip to 2 min 18 second mark where they discuss how they’re using Kinect at this link. That’s pretty scary awesome, huh? Imagine Cup 2012: Kinect Fun Labs Challenge! Are you a student over the age of 16? Are you interested in one day being involved with the art, science, and shenanigans of making video games? Well, have we got an opportunity for YOU! The Imagine Cup 2012 Kinect Fun Labs Challenge asks you to think about entertainment with your social conscience hat on. We task your team of fresh, young space geniuses to build a prototype of your idea that takes advantage of the natural user interface available with Kinect for PC. Our own Challenge Team Captain* Dan Waters will host a very romantic Live Meeting on Valentines Day, Feb 14th. You can follow these instructions to join LINK. If you can’t make it, because you’ve got your own plans for this made-up holiday don’t worry! They’ll be recorded and posted on the Kinect Fun Labs Challenge Web Site; where you can also learn more about the competition. What are you waiting for? Get your team together and go make awesome today! *Dan is a “Captain” more of the “Crunch” variety than the “Ahab” type. We’re always amazed at the ways people have been inspired to use Kinect technology. To my knowledge, this is the first time we’ve seen it used to control something other than a virtual space or avatar AND a motorized skateboard! The space brains at Chaotic Moons Labs have engineered “The Board of Awesomeness” which is steered by the rider with the power of Kinect. This is so. cool. The Board of Awesomeness can travel up to 32 miles per hour! It is a good thing they’re wearing a helmet! What do you think? Do you think you’d like to have one of these for your commute? This week everyone brings their latest, shiniest gadgets, doo-dads, and things-a-ma-jigs to Las Vegas for the annual Consumers Electronics Show (CES). Microsoft is no exception! 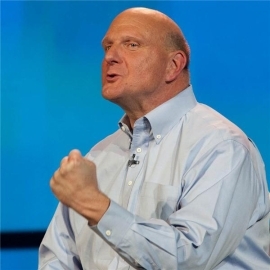 We sent our grand champion benevolent leader Steve Ballmer to speak to the masses of savvy tech lovers about many of the rad things Microsoft has brewing. Balmer says, "YES! I love Kinect!" Team Kinect has been kicking some major behind this year and we earned a shout out from the big cheese! The incredible amount of innovation on Kinect for Xbox 360 this past year shows the potential for Kinect as a platform for developers and businesses to build new and innovative offerings. Along with many others, we have only begun to explore the potential of this amazing technology. This proliferation of creative and imaginative new ideas for Kinect, which we call the Kinect Effect, will expand even further with our commercial release of Kinect for Windows. We are also thrilled to pieces to announce the new Kinect for Windows hardware and accompanying software will be available on February 1st, 2012 in 12 countries (United States, Australia, Canada, France, Germany, Ireland, Italy, Japan, Mexico, New Zealand, Spain, United Kingdom), at a suggested retail price of US $249. Kinect for Windows hardware will be available, in limited quantities at first, through a variety of resellers and distributors. The price includes a one-year warranty, access to ongoing software updates for both speech and human tracking, and our continued investment in Kinect for Windows-based software advancements. Later this year, we will offer special academic pricing (planned at US $149) for Qualified Educational Users. In other words, we’re putting our money where our mouth is and doing all we can to support the space geniuses and visionaries developing sweet Kinect Hacks! We’ve been amazed and inspired by the ways people have made use of Kinect beyond the living room. The Kinect for Windows initiative is intended to support these innovations by giving an affordable, accessible way to utilize Kinect in a way that is more stable and scalable. We’ve seen so many of the ways that Kinect technology fuels innovation in so many industries. For example, Kinect has been used in hospitals to help doctors and nurses maintain a cleaner, more sterile surgical theater. This all kicks off on February 1st, 2012! If you want to learn more about the Kinect for Windows program be sure to visit the Kinect for Windows site and blog. Have you ever felt guilty, because you’re at work and your cat is alone at home where no one is petting it? The poor, fluffy thing is most likely sleeping and no one is home to groom him. He’s just lying there, sweetly dreaming, but not being brushed. YouTuber and Kinect Hacker Taylor Veltrop was tired of the pain the oppressive guilt his daily kitty neglect caused. With just a treadmill, a few web cams, a Wii controler, a small robot, a Kinect and his own ingenuity he was able to solve this age-old problem. Take a look below at what he created and the joy his kitty feels for his new Robot overlord companion. Kinect and NASA Team Up on Mars Rover Landing!